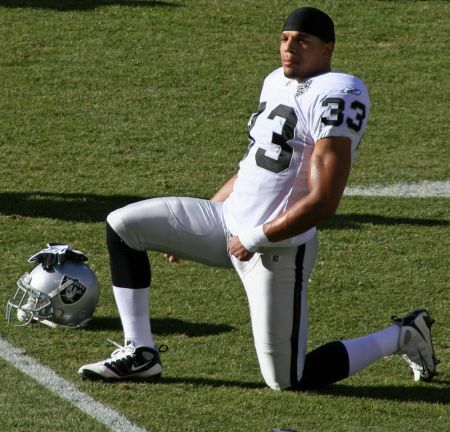 Tyvon Branch, shown here with the Raiders, played one year in Kansas City after leaving Oakland. Of course, he came back to haunt the Silver & Black with a pick six for the Chiefs against his old team in 2015. The Oakland Raiders (10-2) travel to play the Kansas City Chiefs (9-3) on Thursday Night Football this week, and it's a battle for first place in the AFC West Division between the longtime rivals. Dating back to 1960, the Raiders and the Chiefs have played each other 113 times, which is quite astonishing when you think about it. Kansas City holds the all-time edge, 59-51-2, but the records never matter when these two teams play football. If the Chiefs win, they will be tied atop the division with the Raiders. However, if the Silver & Black win, the Raiders will open up at least a two-game lead on both Kansas City and the Denver Broncos with just three games to play. So the stakes are high on TNF, which is something Oakland hasn't been faced with in many years, of course. We took a look back and found these eight notable players that played for both teams in the Oakland-Kansas City NFL rivalry over the years. Enjoy! 8. Tom Flores: In addition to starting 64 games at quarterback for the Raiders, Flores obviously coached the Silver & Black to two Super Bowl championships. Little known fact, though, is he also won a Super Bowl title while playing with the Chiefs in 1969. After starting the season in Buffalo, Flores ended up with Kansas City as a backup to Len Dawson. He threw one pass for Chiefs that season: a 33-yard touchdown to Robert Holmes. 7. Andre Rison: Bad Moon played for seven teams in 12 NFL seasons, including the final four with Kansas City (1997-1999) and Oakland (2000). After making the Pro Bowl in 1997, though, he career went into sharp decline. By the time he suited up for his final season with the Raiders, Rison caught just 41 passes for 606 yards and six TDs. Overall, he caught 174 passes for the two franchises combined, including 18 TDs. One of them was this long one for the Chiefs in 1998 from QB Rich Gannon, who would be the Oakland QB in 2000 when Rison finished his career there. 6. Harvey Williams: This former LSU star ran for almost 4,000 yards in his NFL career, and Williams did it all with the Chiefs and the Raiders. After being a part-time player for Kansas City in his first three seasons (1991-1993), he moved to Los Angeles and posted 983 yards with the Raiders in 1994. When the Silver & Black moved to Oakland in 1995, Williams had his best season (1,114 yards). He played three more years after that, but Williams' career was over almost in the same fashion in which it began. 5. John Matuszak: Tooz is mostly well known for being crazy, and after making his NFL debut in 1973 with the Houston Oilers, he then played two seasons in Kansas City. Matuszak's final six seasons were in Oakland, and he helped the team win Super Bowl XI and Super Bowl XV. After that, he starred as Sloth in The Goonies, a 1980s film that has attained mythical cult status with Gen X. 4. Albert Lewis: One of the better cornerbacks of his era, Lewis made four Pro Bowls during his 11 seasons with the Chiefs (1983-1993), and then he spent the final five years of his career with the Raiders (1994-1998). Even though he only notched four of his career 42 interceptions with the Silver & Black, Lewis scored the only interception-return TD of his career in his final season with Oakland. 3. Tyvon Branch: We put him this high, because he's still active, although now Branch plays for the Arizona Cardinals. He spent his first seven NFL seasons in Oakland before playing one year (2015) in Kansas City. Of course, Branch registered the first pick six of his career for the Chiefs against the Raiders! How is that for becoming a KC-OAK rivalry legend? 2. Rich Gannon: He spent four years in Kansas City, starting just 19 games. In his time with the Chiefs, Gannon threw 23 TDs and just 11 INTs while winning 11 of those starts. Kansas City didn't make the commitment to him full time, so when Gannon went to Oakland, he flourished into the league MVP, leading the Raiders to the playoffs three straight seasons (2000-2002). He also made four straight Pro Bowls as the Silver & Black quarterback. That has to still sting Chiefs fans. 1. Marcus Allen: However, the ultimate sting in this rivalry is on Raiders fans, as Allen left the team after a dispute with then-owner Al Davis and finished out his Hall of Fame career in a Chiefs uniform. Allen made five Pro Bowls in his first six NFL seasons with the Silver & Black, but Davis basically benched him in 1991 and 1992, and Allen totaled just 130 carries in those two seasons. He went to Kansas City in 1993 and promptly led the NFL in rushing TDs while making the Pro Bowl once again. Allen scored 47 TDs in his five seasons with the Chiefs, and that surely stung the Raiders.